The Signarama Franchise Package includes everything you need to run your business from Day 1. As a UK business model, for a UK market, our turnkey package not only gets you launched, but also continues into the life of your business. From start to finish, we guide you through the transition of becoming a new business owner. This means the right training and assistance to develop a successful business. Every step of the way, you’ll work with our experienced staff members who are there to assist in preparing the location best suited for your new business. Once you open your doors, we’ll help you advertise and increase visibility by setting up your own website and location-specific social media. When you choose to franchise with Signarama, you invest in yourself by choosing a trusted brand with a proven business model. All of the guesswork is removed as we supply you with our tried-and-true systems, manuals and training guides. There are many advantages to becoming a Signarama franchisee, and one of them is our highly recognised comprehensive training program. We make sure you get off to the right start with all the tools you need to succeed. • We’ll support you with site selection, lease negotiation, renovations and more. • We help with the installation of fixtures, furniture and equipment. • We also set up your computers and give the software systems you need to run your business smoothly and effectively. When your location opens, you’ll have access to our state-of-the-art technology and equipment, as well as our research and knowledge of the industry. We’ll also help you get the best deals by tapping into our alliances with suppliers and by receiving discounts on mass purchases. Huge Potential for Repeat Business – Impactful signs help increase brand awareness for the stores and businesses in your local area, helping them to increase their sales and grow. The success of those businesses fuels your success, as about 70 percent of our business comes from repeat customers. This chain of positivity means that by supporting and bettering your community, you can help your own franchise location thrive. No Sign Experience Required – Many of our successful franchisees have no experience with graphics, signs or even running a business when they started. They have come from a variety of different backgrounds, such as finance, IT, Sales, Marketing and Engineering. We provide a comprehensive five-week training program that will cover everything that you need to know to open your doors. Continuous Support – Our support is unmatched. It doesn’t end when your doors open; we also provide continuous training and support to help you succeed, and to ensure that you’re up to date on the latest developments in the industry. Our mentoring program sets you up with a successful franchisee that can guide you as you begin your career with us. 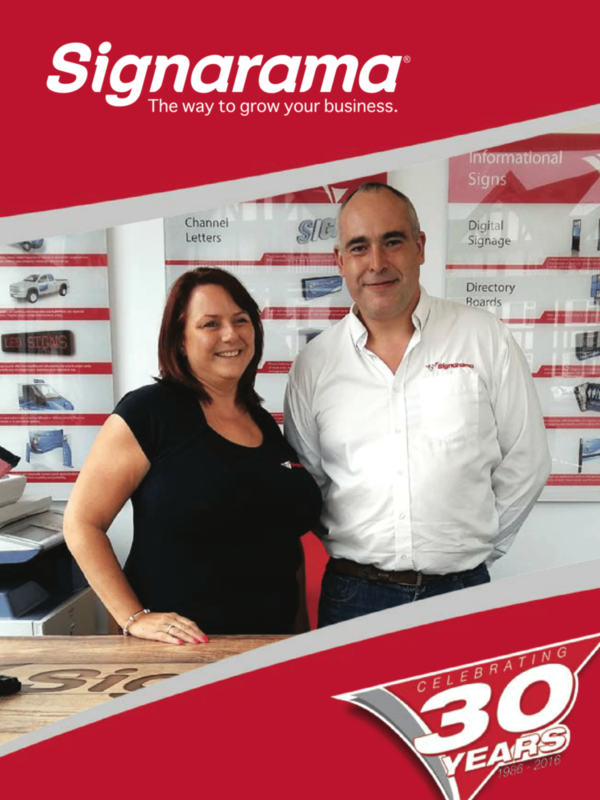 Please call us on +44 (0) 7425 605022 or email franchise@signarama.co.uk for an information pack and an invitation to meet us to find out more. We will work with you on the exact costs and associated financing model that works for you to ensure the total investment covers everything you need to set-up and run your business. The price of the full franchise package is £35,000 +VAT. In addition, you will need to consider start-up costs and working capital. However, this normally is not a problem, as we enjoy a long-standing relationship with finance companies and franchise departments of leading High Street banks who are willing to lend up to 70% of the overall investment required (subject to status), to prospective Signarama franchisees. You will therefore only be required to provide the final 30% of the overall investment. There are two models for store fit out that you can select from, depending on your investment appetite and business style. A Signarama Light enables you to get your business started with a smaller outlay while a Full Service Sign Centre gets you a fully equipped production facility from the outset. Both with enable you to run a successful Signarama which breaks even in 12 months. There is a monthly Management Service Fee, payable by all franchise owners, which covers dedicated support, licencing and use of the brand. Here at Signarama it is important to us that franchise owners are incentivised to maximise the revenue you earn from your store and therefore we operate a reduced fee, based on business performance. Franchisees also contribute towards a National Marketing Fund. This fund is managed by elected franchisees who work in collaboration with Signarama Business Support Centre. The fund concentrates on developing promotional and branding activities to support lead generation for the bene඀t of the network.